It is the Disney party that only comes around once every two years. That's right, folks. It's D23 time and that means there is a whole lot of news coming from a bunch of upcoming Disney projects. Since the Mouse House currently owns a whole lot of various franchises, that includes quite a few things. Namely, Star Wars. With the release of Star Wars: The Last Jedi getting closer, Disney decided to showcase the highly-anticipated sequel at D23 this year. And we've got the footage for you. Given what is currently going on with the Han Solo movie, Disney didn't provide us with any updates on that movie at D23. But they did gives us more than enough from Star Wars: The Last Jedi to make us forget all about those problems. At least for now. As they did for both Star Wars: The Last Jedi and Rogue One: A Star Wars Story, Disney unveiled an incredible behind-the-scenes sizzle reel that gave us a ton of new footage and wowed the crowd. During the live-action movies panel, Alan Horn welcomed Rian Johnson, the writer and director of the latest chapter in the Skywalker saga, Star Wars: The Last Jedi. 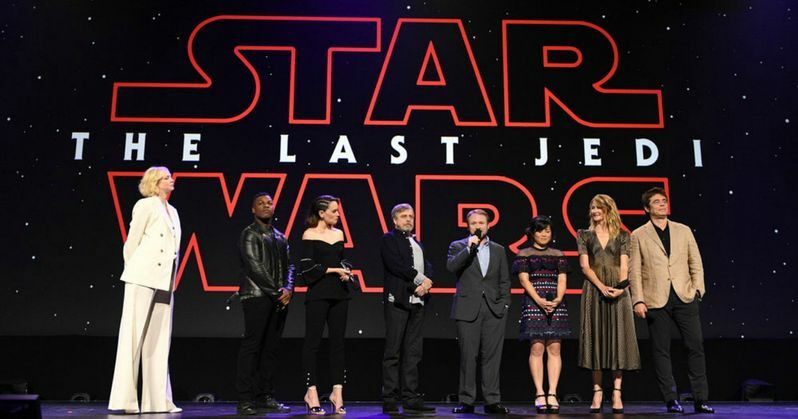 Johnson thrilled the audience by introducing talent from the movie, including Mark Hamill (Luke Skywalker), Daisy Ridley (Rey), John Boyega (Finn), Gwendoline Christie (Captain Phasma), Kelly Marie Tran (Rose), Laura Dern (Admiral Amilyn Holdo) and Benicio Del Toro (DJ). The cast talked a little bit about the movie and Johnson showed some photos, but they couldn't reveal too much. Lucasfilm is still playing this one pretty close to the chest. Since 2009, Disney has been bringing us the bi-annual expo, which has celebrated all of their many fans, but ultimately serves as a great way for them to showcase all of the many films and franchises they have under their roof. D23 Expo is three days packed with exclusive sneak peeks at upcoming movies, celebrity appearances, looks at what's coming from Disney Parks and Resorts and Walt Disney Imagineering and a lot more. SInce Disney purchased all of Lucasfilm in 2012, D23 now is one of the premiere places for them to showcase new Star Wars stuff. Like Star Wars: The Last Jedi. Star Wars: The Last Jedi is set to arrive in theaters on December 15, 2017. Since Star Wars decided to not showcase at San Diego Comic-Con this year, this is the last major event that Disney will have before the movie arrives. For those who couldn't make it to D23 to see the event for themselves, we have a video showcasing the highlights from the panel which you can check out for yourself below. Keep your eyes peeled for the rest of our coverage from D23, as we will have all of the big news as well as more panel videos throughout the weekend.